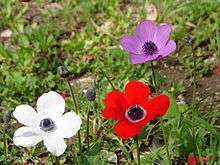 Anemone /əˈnɛməniː/ is a genus of about 120 species of flowering plants in the family Ranunculaceae, native to temperate zones. The genus is closely related to Pulsatilla ('Pasque flower') and Hepatica; some botanists even include both of these genera within Anemone. According to the Oxford English Dictionary, Greek anemōnē means "daughter of the wind", from ánemos the wind god "wind" + feminine patronymic suffix -ōnē. The Metamorphoses of Ovid tells that the plant was created by the goddess Venus when she sprinkled nectar on the blood of her dead lover Adonis. The name "windflower" is used for the whole genus as well as the wood anemone A. nemorosa. ↑ Germplasm Resources Information Network (GRIN) (2007-05-10). 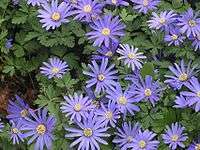 "Genus: Anemone L.". Taxonomy for Plants. USDA, ARS, National Genetic Resources Program, National Germplasm Resources Laboratory, Beltsville, Maryland. Retrieved 2008-05-15. ↑ International Organization for Plant Information (IOPI). "Plant Name Search Results". International Plant Names Index. Retrieved 2008-04-18. 1 2 3 "5. 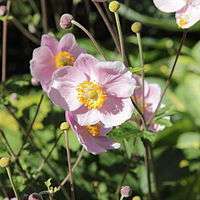 Anemone Linnaeus". Flora of North America. 3. Archived from the original on 4 May 2008. Retrieved 2008-05-16. ↑ Shorter Oxford English dictionary, 6th ed. United Kingdom: Oxford University Press. 2007. p. 3804. ISBN 0199206872. This article incorporates text from a publication now in the public domain: Chisholm, Hugh, ed. (1911). "Anemone". Encyclopædia Britannica (11th ed.). Cambridge University Press. This article incorporates text from a work in the public domain: Porter, Noah, ed. (1913). "Webster's entry needed". Webster's Dictionary. Springfield, Massachusetts: C. & G. Merriam Co.
Wikisource has the text of the 1911 Encyclopædia Britannica article Anemone. "Anemone L.". Integrated Taxonomic Information System. Retrieved 15 May 2008. Natural Resources Conservation Service (NRCS). "PLANTS Profile, Anemone L.". 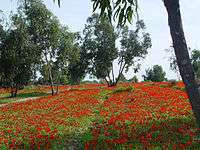 The PLANTS Database. United States Department of Agriculture. Retrieved 2008-05-16.